Weird Old Friends: “News of the Weird” columnist Chuck Shepherd (l), Mr. Media podcaster Bob Andelman. 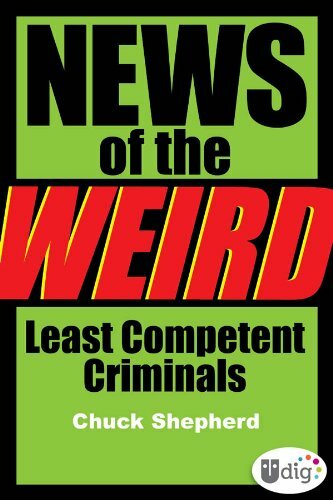 Order News of the Weird: Least Competent Criminals by Chuck Shepherd, available right now at a great price by clicking on the book cover above! If it’s the 12th of the month — any month — Chuck Shepherd can be found eating a large pepperoni pizza pie. It’s a rare taste treat for the normally diet-conscious newspaper columnist, the world’s reigning expert on mankind’s most caustic behavior. Every week for the last seven years, Shepherd’s syndicated weekly column, “News of the Weird,” has caused readers of 250 newspapers to laugh out loud on buses, trains, taxis and in the privacy of their bathrooms. 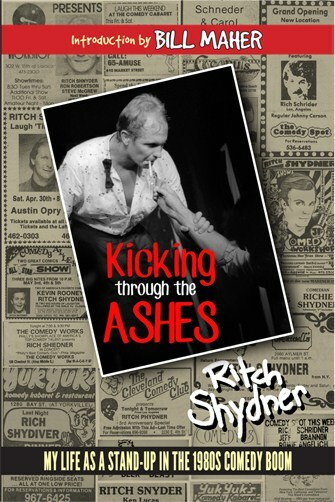 Reading and laughing hysterically over his carefully culled nuggets of bizarre deaths, stupid criminals, sexual kinks and embarrassing moments in the lives of once-private citizens is one of Americans’ guiltiest pleasures. Over lunch at one of St. Petersburg, Fla.’s premier pizza palaces, Mr. Media and Mr. Weird toasted Shepherd’s new book, The Concrete Enema and Other News of the Weird Classics (Andrews and McMeel). First of all, where did he ever come up with such a painful sounding title? “That was your idea, remember?” Shepherd says, rolling his eyes, knowing the question was a test. The title suggested itself more than a year earlier, the first time we met for lunch. Shepherd always arrives with newspaper clips and trivia; that day, he told the extremely weird story of the concrete enema. 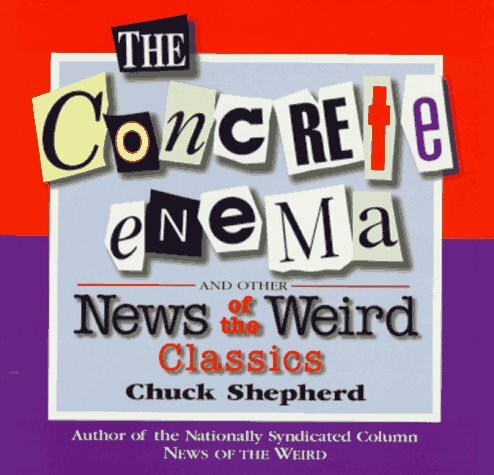 Order The Concrete Enema: And Other News of the Weird Classics by Chuck Shepherd, available right now at a great price by clicking on the book cover above! “There are very few stupid criminal stories because every one of those I hear sounds like a variation of something I already reported,” he says. In fact, his last collection was America’s Least Competent Criminals (HarperPerennial). • “Dumb Robbers.” For example, the guy who holds up a bank but leaves his wallet on the counter or locks his keys in the getaway car. 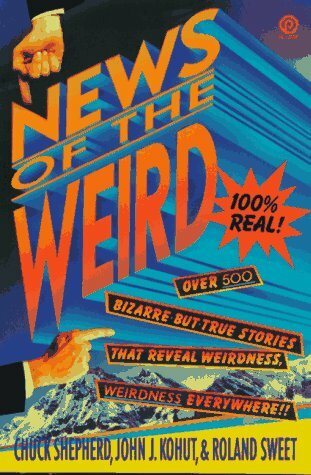 The “News of the Weird” column — plus the four previous books it inspired and two zines, View From the Ledge and Planet Chuck — develop from the hundreds of newspaper clippings Shepherd pores over every week. He personally reads five daily papers and subscribes to 75 journals, magazines, newsletters and zines. What he doesn’t spot first comes via a worldwide network of correspondents who eagerly comb local papers from Toledo to Tokyo, seeking out weird news with which to impress the master.